For most of us, putting is a challenge at the best of times, but can you imagine putting with a ball that refused to go straight? When putted, the Unputtaball jumps, baulks, skids and gyrates. 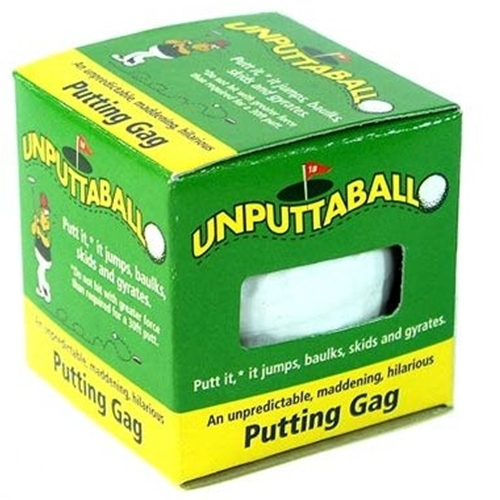 It's an unpredictable, maddening, hilarious putting gag, perfect for a laugh, or pulling a swifty on your mate who takes the game perhaps a little too seriously. Try challenging a mate to a competition and see who can putt the Unputtaball in the least amount of strokes. No matter the point, the Unputtaball is a must for anyone's golf bag.